As Croatia is largely a Roman Catholic country, Easter is the holiest day of the year. Easter observances begin on Palm Sunday and continue throughout Holy Week. In many towns, there are different ceremonies and processions every night, as well as styles of beautifully decorated eggs. Croatians take care in preparing baskets of food which are blessed at a late night Mass; the contents are then enjoyed the following Easter morning. 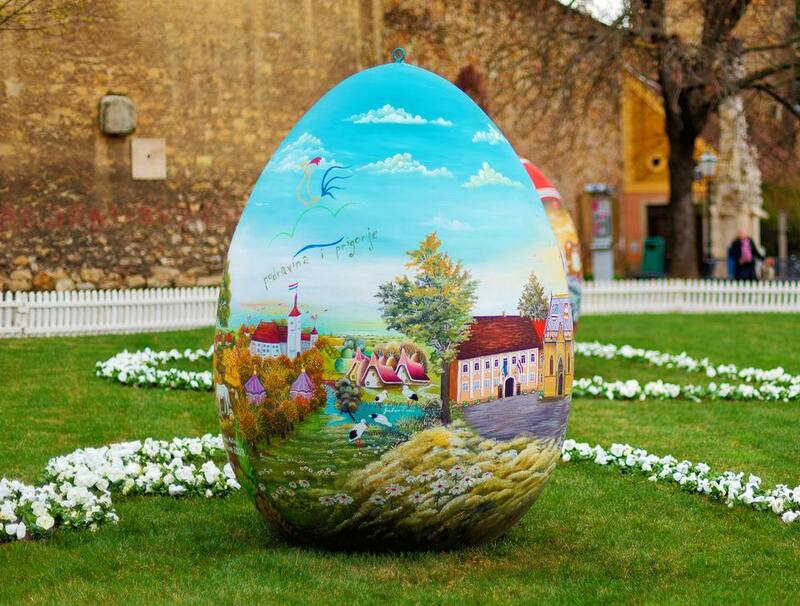 Each town in Croatia may have its own Easter practices to celebrate the holiday. In the coastal towns of Dalmatia, neighborhood associations put on traditional costumes and sing ancient hymns. There are reenactments from the Bible and a blessing of the city gates. In central Croatia, villagers build huge bonfires known as krijes, kres, or vuzmenica, while others shoot from an old-fashioned pistol called the ku bura. Another custom is to create noisemakers known as klepetaljke or cegrtaljke that vary region to region. Some are made of boards from which metal plates are hung, while others have wheels and sprockets attached to boards that are pulled to make a rattling sound. Palm Sunday begins the Holy Week leading up to Easter, and although it is called Palm Sunday, since palms are scarce in Croatia, olive or rosemary branches are often substituted. The branches are decorated with ribbons and flowers and woven into wreaths or crosses, known as poma. They are taken to a church to be blessed, and after the blessing, the poma are hung around the house as protection against bad luck and evil spirits. Pisanice (from the Croatian word for "colored") are brightly painted eggs, decorated in the different styles of the regions, following an old Slavic custom from pagan times. Before paint became common, villagers used natural dyes made from plants and vegetables. The most common color for eggs was red because of the abundance of red beets. In some areas, soot would be mixed with oak to make a dark brown color, and green plants would be used to make green dye. In addition to the eggs being dyed vibrant colors, they are also covered with phrases and artwork. The most common phrase put on pisanice is "Sretan Uskrs" or "Happy Easter." Other decorations are doves, crosses, flowers, and wishes for health and happiness. Simply colored and undecorated hard-cooked eggs remain on the dinner table all day for family and guests to enjoy before the main meal is served. They are also used in a game known as kockanje or tucanje, which is similar to the Greek game known as tsougrisma, in which opponents knock their eggs into each other to see whose egg comes out the winner (meaning unbroken). The more elaborately decorated pisanice are exchanged with friends and family. Years ago, it was common for young men to give the girl they admired a pisanica. The faithful attend a late night Mass at which the foods in their baskets are blessed and eaten for breakfast on Easter morning. Traditional Easter breakfast foods are ham (which is sometimes baked in a bread) or roast lamb, along with raw radishes, spring onions, and horseradish (hren). Also, many of the other foods that were forbidden during Lent are part of the Easter table. A special fruit-studded yeast-raised Easter bread that is almost like a cake, called pinca or sirnica, is the highlight of the meal. It is usually round in shape with the sign of the cross cut into it after it has risen before it is baked. Some families make Croatian Easter bread dolls (Primorski Uskrsne bebe), a slightly sweet yeast bread, braided around a colored egg, giving the appearance of a swaddled baby.